A school for girls and young women from ELC to Year 12 with an outstanding reputation for excellence. Co-ed Kindergarten and Pre Prep. For the full range of our programmes, please contact our Registrar, Mrs Nadine Hibbert, at Registrar Email. Ruyton recognises the importance of providing the best possible learning environment for its students and staff. Ruyton has state-of-the-art learning centres: a Library Resource Centre, the Prue Gillies Building, the Margaret McRae Centre, the Year 11 and Year 12 Centre, and a recently redeveloped Junior School. The Ruyton Aquatic Centre completes the School’s comprehensive Physical Education, Health and Wellbeing facility. We ensure that every aspect of teaching and support is designed around an individual girl’s needs. This enhances student engagement, motivation and commitment to learning. It underpins a collaboration and rich involvement between the girls and staff that achieves the very best individual results. The curriculum at Ruyton is wide-ranging, challenging and creative, with an emphasis on personalised learning. We continue to develop innovative programmes to expand the learning experience for girls and are committed to utilising information and technology within the classroom.The girls are able to use the most up-to-date digital devcies. Broad extension opportunities for selected and highly able girls are offered through the Ruyton Gifted and Talented Programme in Years 5-8, and the Ruyton Master Scholar Programme in Year 7-12. Ruyton aspires to give each girl an opportunity to learn and grow so that she achieves educational excellence and personal fulfilment. commitment to community service, sustainability and a global society. Ruyton is a community that believes in girls. 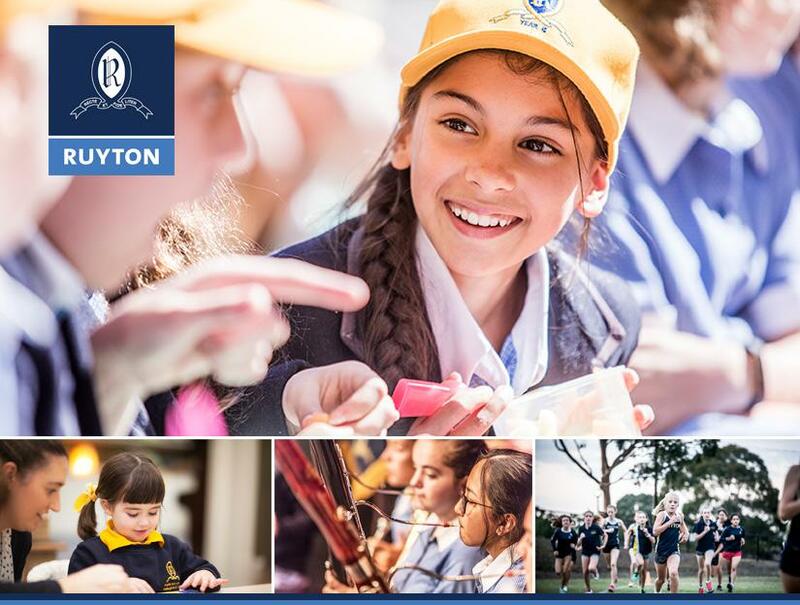 The Ruyton we know today, situated at 12 Selbourne Rd, with over 900 students from Early Learning to Year 12, is a community that is deeply connected and proud of what we stand for. As an independent, forward thinking girls’ school we are committed to preparing girls for a lifetime of learning, leadership and engagement in our global community. We are a community that believes in girls. This is who we are. In 1878 the newly widowed Mrs Charlotte Anderson began a school in the back room of her rented home at 63 High St Kew. By 1880 Mrs Anderson reported that she had 21 students, enough to warrant advertisements in The Argus. As 1881 drew to a close Mrs Anderson made the decision to move her school from her rented premises to Edgecomb in Studley Park Road. With the new property came the need for a new name. Mrs Anderson honoured her great grandfather, the vicar of Ruyton XI Towns in Shropshire England, and named her school Ruyton Girls’ School. This woman of great courage, grit and determination remained Principal until 1888. Her vision laid Ruyton’s reputation for sound scholarship, opportunity and challenge for girls; maintained fiercely by those who followed in her footsteps. This belief is still at the heart of all we do today as we foster the individuality of each girl in a caring and safe environment; nurturing her intellectual, physical, social and emotional qualities essential to flourish. Today, from the Principal’s Study in Henty House, overlooking the Moreton Bay Fig, the daily routines of Ruyton are easily observed : the youngest of our girls whispering to the fairies in the tree, our athletes running in the morning, our Early Learning students peering through the windows on their way to library, or our Senior girls sitting under the windows of Henty, full of social chatter as they eat lunch. It is the rhythm of Ruyton, a rhythm that always seems to be buzzing with the excitement of the moment and the mystery of what lies ahead. This same study was used by Miss Hilda Daniell OBE, Miss Catherine Wood, Miss Margaret McRae, Mrs Prue Gillies AM, and Mrs Carolyn Anderson. The desk used by the Principal today is the very same desk used by Miss Daniell, a proud old scholar who led the School, and indeed saved the School, as Principal from 1913 to 1952. We are a community proud of our history and use the wisdom it provides to inform our future. It is fair to say that Miss Daniell lived and breathed Ruyton. She strongly believed Ruyton had always been a home school, with a friendly association and co-operation between the teacher and the student, resulting in a much happier and more wholesome atmosphere. She felt this homely atmosphere had been greatly enhanced by the fact that Ruyton had actually been a home for many years when Mr Henry Henty and his family lived there. The beautiful garden meant a lot to the girls, just as it does today, and Miss Daniell believed it contributed greatly to their development. A great deal has changed since Miss Daniell wrote these words 90 years ago. Yet her words still strike an important chord; education is for life and it matters a great deal what our girls learn. We now live in a world where content is ubiquitous; free and growing exponentially. Our physical landscape, teaching methodology, understanding of the social, emotional development of girls, adolescents and young women have all evolved. What we know is simply not enough in today’s world, nor has it been for some time. Literacy, numeracy and knowledge of the disciplines will always be an essential component of being an educated person but learning how to ask deep questions, how to interrogate information, and how to apply thinking in different contexts is education future proofing; and it is a necessity not an option. It is increasingly important to take our knowledge and apply it in new and unfamiliar situations, to actively seek issues and problems and solve them critically and creatively. We need to be able to innovate and to have the ability to determine what to do when we actually don’t know what to do. To be bold and thoughtful by asking deep questions, interrogating information and applying our thinking in different contexts. These are the new measures of true learning. It is hard to believe that our current Prep girls will be finishing Year 12 in 2030; but we are very aware of our responsibility to educate these young women for their future. We know that students learn best and engage fully when the work is meaningful and there exists real purpose and challenge. We strive to provide opportunities for student voice and agency, whilst equipping our young women with future focussed skills, attitudes and dispositions. We inspire girls to be bold. We educate girls to live lives of impact and purpose. We are a community that believes in girls. This is who we are. Yesterday was the final School day for our Year 12 girls as they move into their study leave and examination phase. Early in the morning 83 excited Wonder Women scootered down the front driveway to a fanfare of whistles and a lot of giggling, then gathered in the Courtyard Café for breakfast with our Year 12 parents. To commence this final day, a moment of great significance with parents and daughters together, is a wonderful tribute to the family experience that is such an important part of the Ruyton culture. The Year 12 final Assembly highlighted their unique experiences, their ability to laugh at themselves, and their strong sense of connection. As always, the younger girls have watched with fascination as their heroes, ‘the big girls’, re-entered their childhood for the past two weeks. Yesterday was the absolute highlight for them as they shared this joyous occasion for the Year 12 girls and expressed their thanks for a year of leadership and friendship. Last night our Year 12 students, parents and staff gathered for the Valedictory Dinner, where the Class Valedictorian delivered a beautiful reflection on the Ruyton journey for this group of girls and a parent also gave a heartfelt message. Whilst the mood across the day was joyful, it was also emotional, as these fine young women recognised the power of support and friendship they have experienced across the Ruyton family. The Class of 2018 has a strong sense of togetherness and will continue to be a force to be reckoned with, as well as providing a lifelong haven and network for those who have made a significant journey together. After 15 years of schooling, of adventurous learning, curiosity and discovery, these young women are about to embark on a new phase of their lives; one they are well-prepared for and ready to embrace wholeheartedly. Each and every one of our Year 12 girls has enriched the life of the School in her own way through her participation, her endeavour and her support of others. We sincerely thank the Class of 2018 for their efforts throughout this year to provide positive and inclusive student leadership of our community. These young women have stood up for what they believe in, taken action and made a real difference. As a community we thank them for their strong contribution to the School and wider community throughout their time at Ruyton. On behalf of the Ruyton community I wish each and every one of our Year 12 girls every success as they move into the final days of their schooling. We know that they will strive to achieve their personal best and that we, as staff, parents and students, will be proud of their individual endeavours and achievements. Most importantly we are proud of who they are; of their grit, determination, kindness and compassion. In relation to gender equity on an international scale, in 2017 the World Economic Forum ranked Australia in the following areas: Economic Participation and Opportunity (42), Political Empowerment (48), Health and Survival (104), and Educational Attainment (1). Overall, this equates to a gender equity global index rank of (35) for Australia. It is not unexpected that New Zealand (9) and Canada (16) ranked higher than Australia, but Cuba (25) and Nicaragua (6) might surprise you. There are many complex reasons why women do not have equal participation and reward in our society, however, these reasons are linked to social and cultural influences associated with gender. We witnessed the positive power of community in full force at the Ruyton/Trinity production of The Wiz last week. I think ‘joyous’ is the only way to describe us as an audience as we sat spellbound by the adventures of a girl, a scarecrow, a tin man and a cowardly lion. This power reinforced the ability of the Arts to focus our attention, to marvel, wonder and imagine, and to bring us together to celebrate endeavour, achievement and excellence. Academic, psychologist, author and champion of grit, Professor Angela Duckworth, has said that children need to understand why sustained and concentrated hard work is such an important skill, and then they need to practise it; and they need to identify something they're passionate about. She believes that if you want to reach your potential, live meaningfully and make a contribution to the world, then find something you care about, surround yourself with supportive people who will give you honest feedback, and practise, practise, practise. This, according to Duckworth, is the secret to life. While we marvelled at the performance, we were all too aware of the hours, days and weeks of preparation that enabled this. The performers, staff, orchestra, backstage crew and parent supporters have lived and breathed The Wiz for the past few months - alongside their usual routine. Their shared passion and purpose have enabled them to remain committed through the ups and downs of preparation, to accept honest feedback, to show grit and determination, to overcome setbacks and difficulties, and push towards reaching their potential - and beyond. The notion of honest feedback is an important one in Performing Arts. A performance doesn’t attract a score, a percentage or a grade. It isn’t for a gold medal or a trophy. Thank goodness. To me, it provides one of the purest forms of feedback, the honesty of self-reflection and audience reaction. Greater creativity results from enlisting enthusiasm and personal best rather than assessment. And a standing ovation on Saturday evening said it all. Beauty is in the eye of the beholder. We watch our students take their tentative first steps in Early Learning and Junior Primary performances. We see them hone their talents and grow in confidence from Primary to Secondary productions and plays. Over the years we see individual growth and the emergence of new and undiscovered talent. We see students who immerse themselves in every opportunity, as this is what brings their passion to life. Each year brings a new team together, a new rhythm, a new challenge and new opportunity. A little magic goes a long way. Dorothy, Scarecrow, Tin Man and that Cowardly Lion demonstrated this as they eased on down the road to see the mysterious Wiz and realise their dreams. And Dorothy, in helping her three companions to realise their individual dreams, reminded us that we often hold the key to achieving our own personal best. If we believe in our own ability, find our courage, compassion and creativity we can do it. And the positive power of a supportive community will never go astray. Inspired by the popular photo project of the same title that went viral in 2015, Strong Is the New Pretty by Kate T Parker is a photo-driven book comprised of memorable photos (with minimal text) of fierce and joyful girls. It is a celebration of what it means to be strong; the strength and spirit of girls being 100% themselves. It serves as a strong reminder that real beauty is about being your authentic self and owning it, whether that be athletic, bookish, brainy, brave, loyal, or courageous. The photographs champion the message that girls are perfect in their imperfection; beautiful in their chaotic, authentic lives; and empowered by their strength instead of their looks. They are messy. They are loud. They are thoughtful. Wild. Full of life. Adventurous. Artsy. Silly. Funny. Strong. Stubborn. Proud. Independent. Resilient. Bold. So simple and yet so powerful, Strong Is the New Pretty celebrates spirit in words and smiles, an affirmation of the fact that it’s what’s inside you that counts. Strong Is the New Pretty conveys an important message for every girl, every mother and father of a girl, every coach and mentor and teacher, for everyone in the village it takes to raise a strong and self-confident person. International Women’s Day is a global day celebrating the social, economic, cultural and political achievements of women. The day also marks a call to action for accelerating gender parity. With the World Economic Forum’s 2017 Global Gender Gap Report findings telling us that gender parity is over 200 years away, there has never been a more important time to continue the focus on equality. This year, International Women’s Day came on the back of unprecedented global activism for women’s equality fuelled by movements and issues ranging from sexual harassment and femicide, to equal pay and women’s political representation. There is currently a strong global momentum striving for gender parity. Our inspiration often comes from hearing the bold stories of others, because seeing is believing. When we see what others are truly capable of we start to contemplate our own boundaries, fears and dreams, and begin to take risks. At Ruyton we actively support transforming momentum into action; empowering women in all settings, rural and urban, and celebrating the activists who are working relentlessly to claim women’s rights and realise their full potential. To raise our girls to believe in themselves and to believe in and support each other; that is our aim. Michelle Obama, former First Lady. This year our Year 4 girls became only the second school of students in Australia to become involved in the international programme Level Up Village. The mission of Level Up Village is to globalise the classroom and facilitate seamless collaboration between students from around the world via pioneering Global STEAM (STEM + Arts) enrichment courses. We became digital pen-pals with classes at Bay Primary School in South Africa, some 40 km outside of Cape Town. Our girls were paired or grouped with students from that school and while the STEM focus for both schools was the Global Water Crisis, our girls gained much more than the experience of building aquifers and water filters. Our Year 4s made videos to share with their buddies, undertook joint project tasks and learnt a great deal about the impending and looming fear in South Africa that is Day Zero, a predicted day postponed in 2018, where the taps in homes throughout Cape Town would not turn on due to a generational drought. While our girls had to reflect on their family’s own current water use, they learnt a whole lot more. We set time each week to make video entries for our buddies in South Africa to read. While these revolved around the Global Water Crisis there were also times when joint questions were posed, such as ‘If you came to my country where would I take you?’ It was great relationship-building, with some of the South African children wanting to take our girls to wildlife parks and some of our girls wanting them to visit the MCG and Great Barrier Reef. Some students at Bay Primary in Kalk Bay don’t have internet or technology at home and sometimes their exposure to suitable technology occurs only once a week at school. Lessons in sympathy and empathy were highlights of our learning journey, as was working collaboratively with classmates and students half a world away and experiencing the foibles often associated with technology being managed and stored in different parts of the word.